Home / Posts Tagged "Spoleto"
Simmel considered landscape as a «work of art in statu nascendi», and it exists on the basis of three unavoidable conditions: it cannot be realized without a subject, without nature, and without the contact between them. The relationship, in particular, is expressed through the signs, the constructions created by man on the territory and then through agriculture, the litmus paper of that union’s happiness. But the relationship can also be the one given by the visitor who, with his curious look, characterizes a zone, linking its significant traits with the concept of typicality. Between Spoleto and Assisi, where millions of olive trees follow one another for about thirty-five kilometers, that type of relationship finds its highest shape. In the Fascia Olivata (Olive Tree Belt), stretched at seven hundred meters of altitude, the history of olive cultivation begins long time ago, indeed. The olive tree is, for Fernand Braudel, the «plant of civilization», because it marks the boundaries of the ancient Mediterranean area; the oil was used as a seasoning, for religious rites, but also in the pharmacopoeia and lighting. On the Edict of Rotari (643 BC), for those who had cut an olive tree, it was inflicted a punishment three times severe than the one imposed on anyone who cut any other fruit tree. Finally, according to Castor Durante from Gualdo Tadino (1586), some olives at the end of the meal helped digestion. But without spending too much time in reading books, just take a trip to Bovara, near Trevi, and admire the legacy of that tradition with your own eyes. The majestic Olive Tree of Saint Emiliano, with its nine meters of circumference and five in height, is a specimen seventeen centuries old. Leaving aside the story of the decapitation of Saint Emiliano, Bishop of Trevi – attached, at least according to a code of the IX Century, to the plant and then beheaded – the studies have shown that the olive tree belongs to a particular genotype, very resistant, that after the first eight hundred years of life saw the inside of his trunk rotting and then outer parts divide, turning counterclockwise. The olive growers know that these areas of Umbria require a rather strong cultivar, able to cling to the dry soil, which cannot maintain moisture. The Muraiolo variety has therefore been designated as the ideal plant to ward off the hydrogeological risk in the area and, at the same time, to give that typical oil with a spicy and bitter taste, refined by aromatic herbs. Its cultivation has also altered the territory, remodeling it, forming a continuous upward strip that is detrimental for the forest. It has characterized the area with embankments, lunettes and terracing, making it recognizable to the point of enrolling it in the catalog of Historical Rural Landscapes, along with the Plestini Highlands, the emmer fields of Monteleone di Spoleto, the hills of Montefalco, the cliff of Orvieto , the knoll of Baschi and the plateaus of Castelluccio di Norcia. Goal that follows the subscription to the Cities of Oil National Association – which brings together all the Municipalities, Provinces, Chambers of Commerce and LAGs producing environmental and cultural values, centered on PDOs – and preludes to the recognition of the area as a FAO Foods Landscape (it would be the first in Europe) and then as a UNESCO site. The greatest danger that the landscape can incur – not to be enrolled into collective memory and not to be recognized as characteristic of a Planet’s particular area – is thus avoided: no one, whether it is born in that place or from afar, can now separate the Fascia Olivata from the cities of Assisi, Spello, Foligno, Trevi, Campello sul Clitunno and Spoleto. However, the objective is not to transform the territory into a museum, but to link it with its cultural and community heritage, even to preserve it from the changes that might destroy it. Indeed, the years of World War I are not too far, when the olives were cut to fill the lack of coal in the Northern factories; neither the terrible frosts of 1929 or 1956, which led to a significant contraction in production. Neither the Sixties are not far away, when fashion preferred seeds oil instead of the olive one, as well as failing to find labor for every autumnal harvest. Above all considering that the dictates, established by the Trevi Olive Growing Cooperative, born in 1968 to overcome the familiar dimension, are very strict: all the olives must come from the territory of Trevi, they must be hand-collected and delivered to the mill within few hours , and they have to be pressed within twelve hours to maintain the right levels of acidity and oxidation. There is no way for industrialization and mass production: this Strip keeps adhering to the genuineness of ancient things in the same way as it encircles the hilly slopes, even the harshest. In this way the visitor can enjoy it, perhaps walking along the Olive Trail between Assisi and Spello, or along the one of Francis, whose symbol was the olive itself. It will be able to reconnect the silver foliage to the spicy flavor of the bruschetta with the new oil – the Gold of Spello – that will pour into his mouth, giving him the same awareness and wisdom of those ancient Mediterranean people who preserved civilization by gifting the Earth olive trees. One of the main characters of Expo 2015 was Strettura’s bread, a distinctive product of Umbria along with truffles, saffron from Cascia, spelt from Monteleone di Spoleto and the red potato of Colfiorito. In this mixture of cultures, traditions and craftsmanship called Expo, Umbria was symbolize by an overworked but genuine product: bread. But why the one from Strettura one? Strettura, unlike what the name suggests, is a beautiful valley placed about 13 km from Spoleto; his width valleys allows the cultivation of ancient cereal varieties, now set aside from the large industrial production. The golden ears cover the gentle slopes, which seem to suggest the rounded shape of the finished product and, before that, the soft texture of the dough, together with the lightness of the leavening. It looks like an oasis, Strettura. Spring waters, that flow from the Apennine rocks, make it a pleasant place to stroll; Spoleto is near, but far enough to leave this village in the tranquility owned by the ancient sites with genuine traditions. 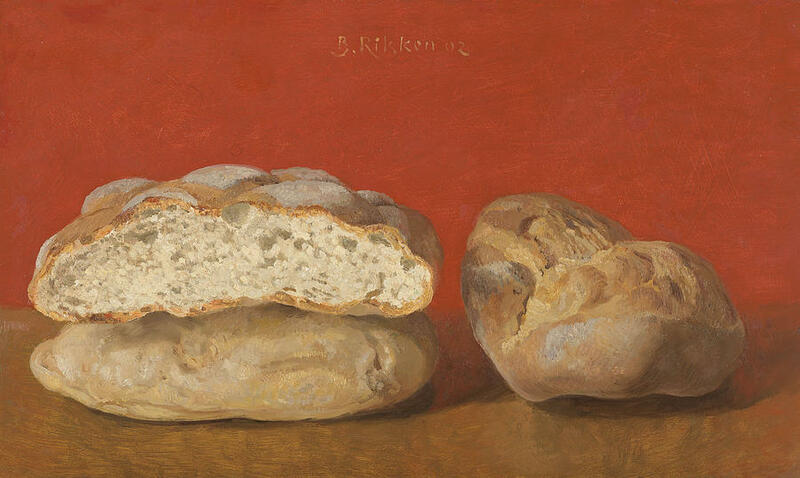 It seems to smell the scent of freshly baked bread, a symbol of what is familiar and good in the things of the world. But Italian habits have changed: the consume of bread, contrary to the past, seems to have diminished. 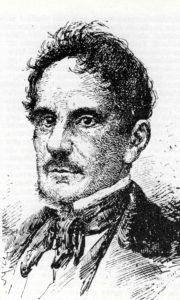 According to Coldiretti, in 2016, each person has consumed 85 grams of bread a day, compared with 1,100 grams a day during the years of the Unification of Italy. A change also evidenced by the countless idioms that concern the goodness of bread and its essential presence on the tables – “You’re as good as bread,” “To sell like bread,” “For kings, there is no tastier food than bread”, etc. Those expressions existed because of the difficulty to find any other nourishing food beside bread, but now they seem shells, emptied from any grip to reality. It is true that we eat less bread, but when we do it, we want to try a unique experience higher than the flatness of industrial production. Today, consumers choose products based on alternative cereals -kamut wheat and spelt, also because of the increasingly amount of food allergies – but they choose also to purchase products at zero distance and high nutritional value, which can somehow raise quality of their culinary experience. More quality and less quantity, therefore, along with the desire to consume products that are the result of love and respect for the Earth, and of the people who perpetrate them. The bread Strettura is emblematic product of these changes in eating habits. It acts also as a link between past and present, combining a production chain that belongs to the past with the modern consumer, more aware and attentive. It’s true, the bread of this Umbrian village is a rare commodity: the crops are limited, peculiar of those lands brushing that side of the Apennines; they use only spring water, with unique chemical and physical properties. The bread itself is not suitable for mass distribution, bound as it is to a slow and handicraft processing. 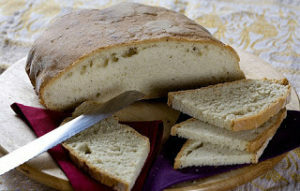 Indeed, it’s composed of wheat flour, obtained by a milling process made by traditional methods: the oilseed and protein parts are not brutally separated from the starch, but, enriching its composition, they let the bread retain an aroma and a unique fragrance, which speak of goodness, simplicity and authenticity. 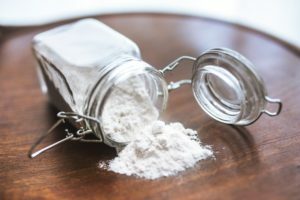 The flour is skillfully combined with the leaven of the previous processing and with little salty spring water: the bread of Strettura is indeed an unsalted bread, like other types from Umbria, Tuscany and Marche. This loaf, marked with a cross in the center, rests all night; the next day, the mixture is cooled with the addition of other warm water and flour. It follows a strictly manual processing, which makes the dough smooth, homogeneous and with a “right” consistency, that only the bakers of Strettura could recognize. Just a few more hours of leavening and finally the loaf can be baked. The cooking is made exclusively in a brick oven fueled by twigs from the Mediterranean forest: they give the filone acciaccato the characteristic aroma which, together with the thin crust and the solid soft part, becomes the perfect side to cured meats, cheese, vegetables and soup. Strangozzi, stringozzi, strozzapreti, bringoli, umbricelli, bigoli, umbrichelle, lombrichelli, ciriole, anguillette, manfricoli: if you ever had the chance to take a ride in the Umbrian taverns, sitting in the rural atmosphere of those rooms and probing the delicious menu, in the section dedicated to main courses you see something with an ambiguous but evocative name. It is not easy to reconstruct the history of a dish with an ancient birth, especially when confusion still reigns even on his name, as it is contamined by the vagueness of the spoken language and by the use of certain customary terms rather than others. But let’s go in order: first of all, we are talking about a type of fresh pasta, rustic because its handmade processing and therefore inaccurate, coarse, whose goodness lies in the roughness of its own composition. Sources agree on the poor origins of this dish, made of the sole water and wheat flour. What makes the difference, however, is the shape it assumes: so, the same dought produces many types of pasta, whose names are often confused because of their etymological similarity. The stringozzi of Spoleto -called strangozzi in Terni, manfricoli in Orvieto, anguillette in the area of Lake Trasimeno, umbricelli in Perugia for their resemblance to earthworms, or even brigoli, lombrichelli or ciriole – are a type of stubby and coarse spaghetti, with a circumference of 3-4 mm and of a length of 25 cm, hand-rolled on a work surface. As the saying goes, the dought must not be excessively stretched; you will pay attention to the thickness only when you cut the phyllo dough lenghtwise with a knife. Strangozzi must be cooked in plenty water, and you have to dredge them up at the exact moment they emerge. They are seasoned with meat sauces, truffles, parmesan cheese or vegetables. Beyond doubt, the most characteristic preparation is the one holding up the name of Spoleto – “alla spoletina” – where tomatos, parsley and hot pepper enhance the taste of pasta. 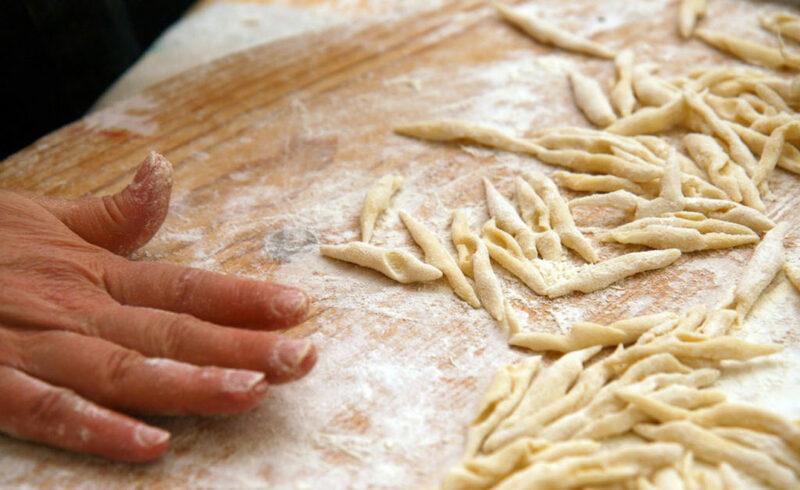 It is curious that strangozzi – for their assonance with the verb “to strangle” – are often confused with strozzapreti, another preparation made out the simple mixture of water and flour. 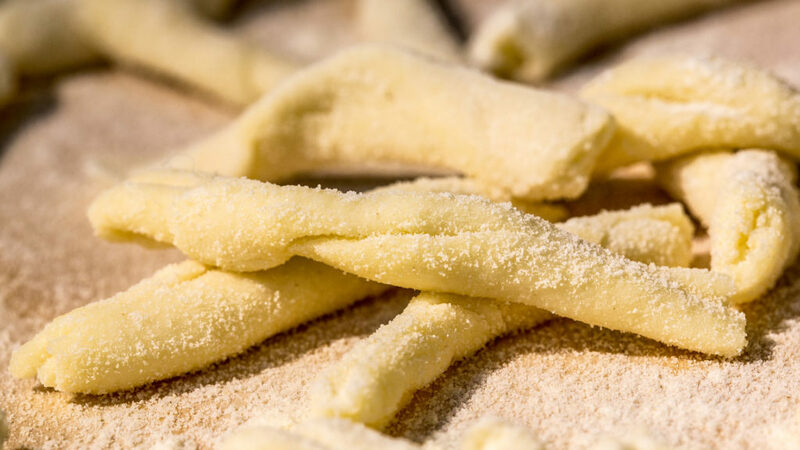 Although the names are often used interchangeably, the shape of strozzapreti is very different from strangozzi one (and their counterparts): strozzapreti are shorter and the strips of dough are rolled up on themselves; their shape looks like shoelaces, once made of tough curled leather. The legend says that the anti-clerical rebels used these strings to strangle the walking ecclesiastics, during the Pontifical State domain. 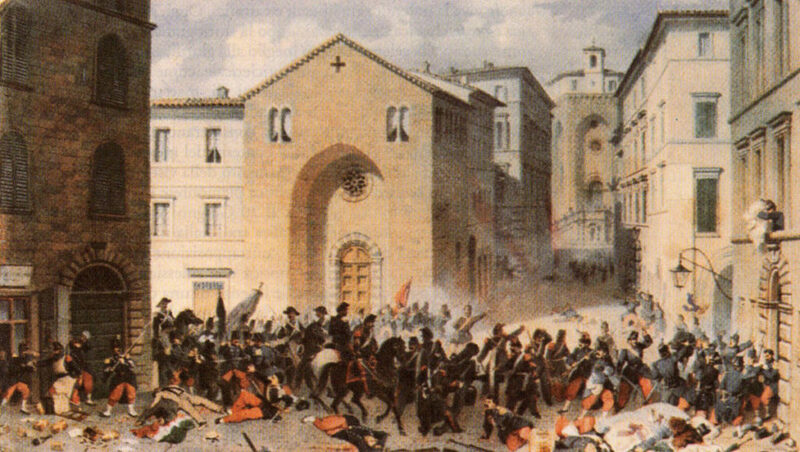 An hypothesis that does not seem too remote, if we consider the constant struggle of Perugia against the interference of the Papal States: when we think about episodes like the Salt War of 1540 or the XIX century anti-clericalism resulted in massacres of Perugia, we do understand the lack of love of the population towards the prelates. The latter, indeed, in addition of collecting taxes were notoriously gluttons, always ready to scrounge meals off the poor people. Another interpretation says that strozzapreti were so called because the housewives, forced to halve the portions to their beloved ones to serve prelates, whished them to choke with the food they were eating. A variant says that the housewives cursed the priests that wanted the eggs as a tribute, forcing them to make a “poor” dought, only composed of water and flour. Thus it appears that the echo of the hungry stomachs of the prelates had spread up to Rome: their appetite was so huge to overcome even the difficulties that the particular shape of strozzapreti gave to the act of eating them. Other than choking: it takes more than a bowl of strozzapreti to extinguish the appetite of a religious! Today, though strozzapreti are produced on an industrial scale, a processing implemented with a bronze die plate makes them rough as homemade ones, allowing the full absorption of seasoning with which they are served. Between the contour of its profile, in fact, the sauces deposite and there remain, giving the palate a pleasant sensation of texture and body, and so are all the flavor of the ancient types of pasta..
Giovanni di Pietro, called Lo Spagna, after his family’s Spanish origins, (Spain 1470 – Spoleto 1528) is one of the protagonists of Umbrian pictorial art between the XV and XVI centuries. Not as well known as other followers of the Umbrian master Pietro Vannucci (some of his more famous students: Pinturicchio and Raffaello), he is an interesting and pleasing artist and worthy of closer study. The young Giovanni was probably in Florence around 1493 when Pietro Vannucci, known as Il Perugino, was among the four more prominent masters in the city together with Botticelli, Filipino, and Ghirlandaio. Perugino at that time assumed a leading role by opening the workshop near the Hospital of Santa Maria Nuova; his studio was on of the most active and was also frequented by numerous students from all over Europe who came to learn “the grace that he had in his own colouring technique” (G.Vasari, 1568). This has led us to believe that our artist may have come into contact with the Umbrian master, subsequently becoming his pupil and collaborator. When in 1501 Perugino opened a workshop in Perugia, a rich town that wanted to renew its style and adopt a more contemporary feel, Giovanni followed him, where he probably also came into contact with Raffaello, another young follower of Perugino. Giovanni worked together with the Master on a series of frescoes for the Franciscan Convent of Monteripido, of these only a fresco of Saint Francis receiving the stigmata remains. It was located on the gable of the façade of the Church and attributed to Lo Spagna and which is now preserved at the National Gallery of Umbria. Critics agree that in the pictorial style of Giovanni di Pietro there is a strong similarity to Perugino’s style of models, which was a fundamental step in the formation of the painter and in obtaining commissions, and also in his ability to grasp the influence of Raffaello while maintaining a personal and simple language that is rich in the fine use of colour and grace. Some of his works form part of collections of some of the most important museums of the world, among which are: The National Gallery, London, The Louvre, Paris and the Vatican Museum Art Gallery, Rome. At the beginning of 1500 the Perugino environment was under the control of the Bottega del Vannucci and in common with Perugino collaborators including Pinturicchio, Lo Spagna needed to move on in search of work in order to be able to create his own entourage. His artistic career finally took off in other Umbrian towns. The beautiful and elegant town of Todi, that dominates the valley of the Tiber is significant: in 1507 a contract was agreed in Todi between the painter and the body of the Church of San Potito to create an altarpiece depicting the Coronation of the Virgin (Todi, Museo Civico) (fig.1), which was completed in 1511 when the artist went to live there and set up a business. In addition to the Montesanto altarpiece, Giovanni worked in the cathedral where he painted various chapels with frescos (between the 1513 and 1515) and he also decorated the organ (1516). Two tablets remain depicting St. Peter and St. Paul and a fragment of a fresco depicting a Trinity (fourth nave on the right, Cathedral of Santa Maria Annunziata, Todi). Another important Umbrian centre in Lo Spagna’s career is the city of Trevi, a village at the top of Monte Serano, beautifully dominates the Spoleto valley, the seat of powerful local families. Here the artist was commissioned by Ermodoro Minerva, ambassador of Ludovico Sforza, to decorate the chapel of San Girolamo in the church of S. Martino. The lunette with the Virgin in Glory with Saints Jerome, Giovanni Battista, Francesco and Antonio da Padova dated 1512 is a fresco with clear Perugino references with its ideal and pleasant landscape, but in more decisive colours. 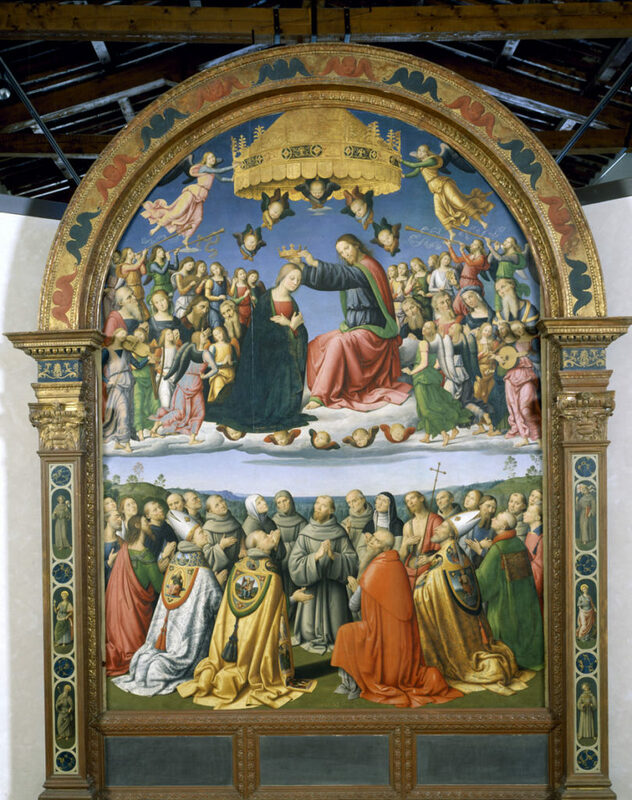 He also created the imposing altarpiece with the Coronation of the Virgin in the same church in 1522 (now at the Pinacoteca of the San Francesco Museum complex). It is rich in pure refined iridescent tones, with solidly constructed figures and subjects and items carefully rendered in an illusionary style, derived from the prototype of Filippo Lippi in the Cathedral of Spoleto (1467-69) and by the Coronation of the Virgin of the Ghirlandaio that he created at San Girolamo in Narni in 1486; both were also referenced to Raphael in 1505 for the altarpiece at Monteluce in Perugia. 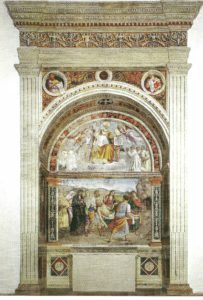 While at Trevi, the Master Lo Spagna, who by now was in demand and lauded by the whole of Umbria, decorated the church of the Madonna delle Lacrime between 1518 and 1520 with references to the sought-after style of Raffaello, shown in particular in the scene of the transportation of Christ (fig.2), where there is a strong association to the masterpiece by the Urbino Master carried out for the Cappella Baglioni in Perugia in 1507 which is today curated at the Borghese Gallery in Rome. This was testament to Lo Spagna’s development in rapid and continual renewal, stimulated by continuous in depth study, in keeping with the requests for special commissions by the more affluent. In 1516 he was granted citizenship of Spoleto, witness to the fact that Giovanni had resided in Spoleto already for several years. On 31 August 1517 he was appointed Head of Art for painters and goldsmiths, confirming his recognition in the role of Head of the school. 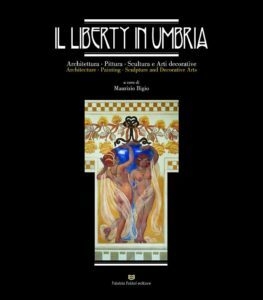 From 1516 onwards, his activities were based in Spoleto and the surrounding centres, based on documentary evidence as well as by a large body of work which reveals the presence of assistance and workshop activities that had assimilated his style. 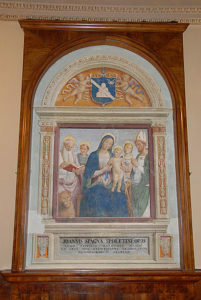 Among the more interesting and significant works are the Madonna Ridolfi a Madonna with Child between Saints Giacomo, Niccolò da Tolentino, Caterina and Brizio commissioned by Pietro Ridolfi (fig.3) who was governor of Spoleto from 1514 to 1516 (Spoleto, Palazzo Comunale), the Virtues painted for the Rocca, removed in 1824 and reconstructed in a monument dedicated to Leo XII (Palazzo Comunale). The arrangement and the iconography of the three allegorical figures, justice at the top, with charity and mercy on each side, suggests their destination was to have been an environment with judicial functions. In Charity, conceived in accordance with a rotating composition, and in Clemency, characterised by the perspective that confers rhetoric in gestures and postures, there are also solutions developed by Raphael in the Roman year, thus suggesting a history ahead of its time. Along the Via Flaminia, not far from Spoleto in the church of San Giacomo Apostolo, the patron saint of pilgrims, Giovanni di Pietro is asked to decorate the apse and two chapels in 1526. 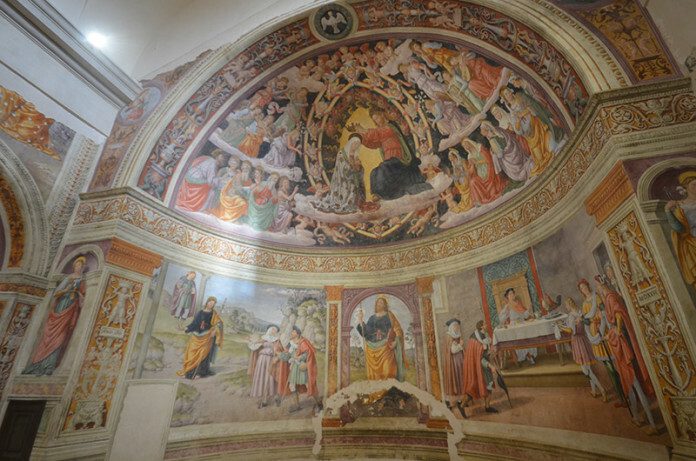 The semi-dome depicts the Coronation of the Virgin (fig.4) and the wall depicts San Giacomo and the Miracle of the hanged man and the Miracle of the chickens. With an extraordinary richness of gilding, colours and grotesque ornaments and crowded with figures, it is scenically complex and it is here Lo Spagna achieved the pinnacle of his career, a rare Umbrian display in a modern style. Durign this time, together with his workshop, Lo Spagna worked at Valnerina: in the church of S. Michele Arcangelo in Gavelli, where there are frescoes dated 1518 and 1523; to Visso in the church of S. Augustine; at Scheggino, where, finally in 1526 he signed the contract to decorate the church gallery of S. Niccolò for which he was offered 150 guilders. Dono Doni was the best known of his followers, but not the only one to collect the baton; his flourishing workshop still today constitutes a characterizing feature of the artistic heritage of the area of Spoleto and the Nera Valley. Among the collaborators to be remembered are also Giovanni Brunotti and Isidoro di ser Moscato, Giacomo di Giovannofrio Iucciaroni (circa 1483-1524) active in Valnerina and Piermarino di Giacomo who in 1533 completed the Scheggino frescoes. Fausta Gualdi Sabatini, Giovanni di Pietro detto Lo Spagna, Spoleto, Accademia Spoletina, 1984. Perugino: il divin pittore, cat. della mostra a cura di Vittoria Garibaldi e Federico Francesco Mancini, (Perugia, Galleria Nazionale dell’Umbria 2004), Silvana Editoriale, Cinisello Balsamo 2004.